Wednesday (28/07 2016), Faculty of Engineering re-develop international cooperation with one of the leading universities in Thailand that focuses on the engineering field of Kasetsart University. 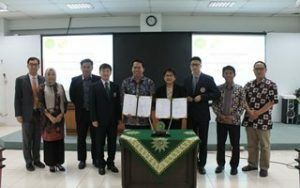 This cooperation started from the research collaboration between the lecturer of Civil Engineering Faculty of Engineering UMY namely Prof. Agus Setyo Munthohar with one lecturer at the university of the white elephant country. This event was directly attended by three heads of study program and vice dean of cooperation field of Faculty of Engineering from Kasetsart University, Thailand at General Stadium Hall of Faculty of Engineering UMY.